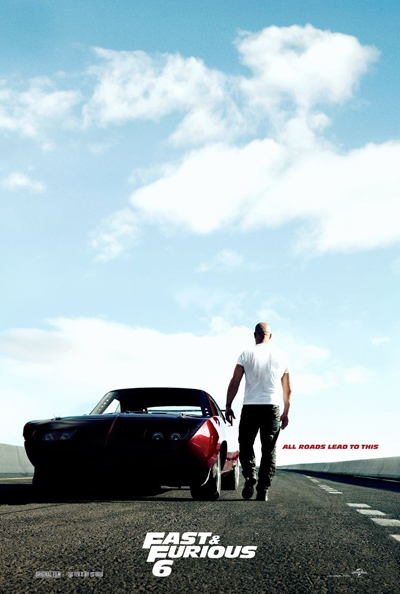 What can we learn from the clouds on this Fast & Furious 6 poster? 1. A sports car and a mushroom cloud. After five films’ worth of wanton motorised carnage, this ominous apparition hints that the sixth entry in the Fast/Furious canon may hold some comeuppance for Diesel and his engine-happy cohorts, in the form of a nuclear explosion and/or other extinction-level event. 2. A crying patient on an operating table. If the use of genocidal WMDs seems an improbable eventuality in a franchise drag racing movie, maybe Fast and Furious 6 has a more personal form of disaster in store. Could the above mirage suggest that Diesel, Paul Walker or their ilk are liable to end up on the operating table, screaming in pain after a particularly grizzly road accident? It’s definitely a possibility. 3. An alien eating a pretzel. Nobody saw it coming in Kingdom of the Crystal Skull either.